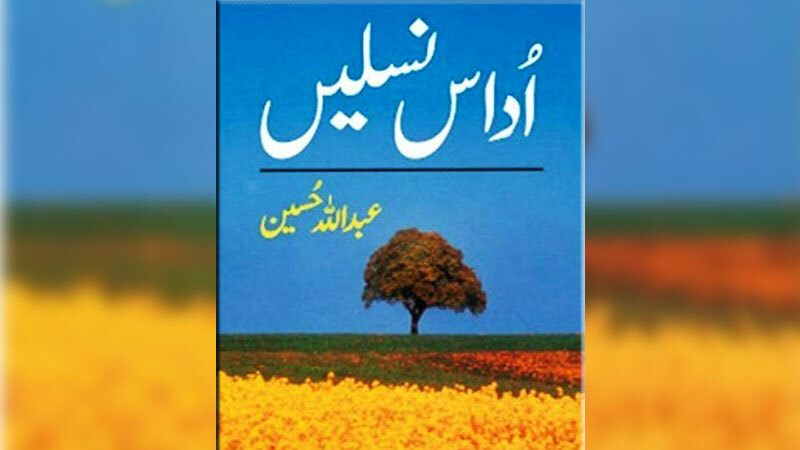 After half a century of its publication, Abdullah Hussain’s novel Udaas Naslain still attracts the attention of critics and readers alike. This novel, along with Quratulain Haider’s novel Aag Ka Darya, has reverberated through the annals of Urdu literary scene for decades. Since no other great Urdu novels displaced them from their enviable position on top of the post-partition literature, the two novels continued to leave a distinct impression on the reading public in Pakistan and abroad. Aag Ka Darya remained the darling of Indian and Pakistani critics, analysts, commentators and historians of Urdu literature because of its immense civilisational expanse that was spread over the past two and half thousand years. Similarly, Udaas Naslain was credited for the personal, local and national scope of its story spread across three and half decades that covered partition at the last end. Abdullah Hussain is specially gifted in terms of creating scenes, literally. This novel is profoundly episodic in nature inasmuch as it is dotted by self-sustaining events or their highly-charged description in the style of participant observation. For example, there are high class parties in Roshan Mahal, the house of a Muslim absentee landlord in Delhi, studded with stars from the upper middle class, political leadership as well as the government officials of British India. Similarly, the protagonist Naeem’s visit to his village Roshanpur on the border between Punjab and Delhi brings out the crass, rugged life of a middle class peasant who cultivates his land, lives in a bigamous household full of tension and the patterns of interaction among Sikhs, Hindus and Muslims in and around the village life. A section of the novel covers the life of Naeem and many other soldiers during World War I ranging from recruitment, training and travel to European and African fronts to actual scenes of battle on the ground and later hospitalisation. Back home, there is the episode of Naeem’s life of a political activist-turned-terrorist in a mountainous area in south India. There is a fisherman’s highly imaginative and illustrative story of the Jallianwalla Bagh massacre in Amritsar. Other episodes relate to scenic description of the protest demonstrations at the time of the visits of Prince of Wales to Calcutta and the Simon Commission to Lucknow, the oppression and depression of life in jail, exposure to a Pathan wedding around Peshawar area that included the carrying of a goat by the bride in her arms, closely followed by the massacre in the Qissa Khawani Bazaar, as well as life in a colony of industrial workers where Naeem’s kid brother Ali lived. Other compact episodes include an industrial action in the cement factory, fishing in the river Jamuna, and the caravan of the sick, homeless, destitute, depressed and insecure Muslim refugees heading to Lahore across the border in 1947. Hussain is a master in the technique of linking an individual’s fate or destiny with the larger causes, mega-currents of the national life or the rugged nature all around in separate episodes. One is reminded of Tolstoy’s deft handling of events of both war and peace whereby each episode has an ebb and flow of its own, along with a centre point and peripheral concerns and the leading characters hobnobbing with secondary characters. However, Hussain’s technique covers some but not all areas of the Tolstoyan domain. It is true that his episodes acquire a life of their own, along with their awesome beginnings and ends linked by a denouement that carries a gruesome message for life in British India. But, there is a cost: the fulcrum of daily life of characters, their interaction leading to a comprehensive endpoint and their growth across time all remain underdeveloped. While Udaas Naslain has a powerful expression of intentions and feelings couched in disparate events and narratives, the leading characters Naeem and Azra as well as their respective younger siblings Ali and Najmi remain far from fully developed. A weak link between strong episodes is the hallmark of the novel. Its characters remain shadowy till the end, as if they are at the mercy of the cataclysmic powers all around, almost like tree leaves driven by the West Wind in the autumn in the Shelleyan idiom. This is not to challenge the grand style and strong message of the novel and its impact on the generation of readers during the 1960s and 1970s, and beyond. The undercurrent of people’s clueless and directionless move forward through the maze of contemporary history defines the intermittent moods of defiance and depression experienced by individual characters. However, as per EM Foster’s theoretical formulation, the novel misses out on compound characters, living their own lives, managing or not managing their social relations and moving forward or backward in terms of their individual patterns of life. Instead, these characters operate as representatives of class – upper or lower, sector – rural or urban, caste – especially the untouchables, and gender – imbued with a peculiar one-dimensional approach to female characters who are typically confined to home but who play a complementary role vis-à-vis male characters in several ways. The novel is weak not only in characterisation but also in what Henry James calls unity of plot. For example, one faces difficulty in focusing on characters that are far from interwoven with a thick – or at least a comprehensive – plot based on description of their regular interactions underscored by meaningful consequences in terms of break-up or rejuvenation of human relations. Instead, the author seems to concentrate on illuminating the characters by projecting their pursuit of higher causes, e.g. freedom from colonial rule or class struggle against capitalism in the case of the two brothers Naeem and Ali respectively. Hussain occasionally but forcefully relies on what modern literary criticism describes as magic realism inasmuch as his characters display a heightened, sometimes uncanny, level of movement in pursuit of their destiny. The first part of the novel is brimful with story-telling. But, the second part ends up with an intellectual engagement with issues of loneliness, nostalgia, historical consciousness, meaninglessness of life and death, role of religion in shaping human consciousness and various other abstracted ideas and thoughts. It seems the novel moves from situating the characters in their respective domains of life and developing their individual patterns of interaction to a stage where the plot starts thinning out and reliance on musing about metaphysical ideas and philosophical themes increases. The higher the novel goes in intellectual expression, the thinner it becomes in terms of action, plot, characterisation as well as the attention and interest of the reader. After all, it is the privilege and right of the reader to draw meaning out of the text of the novel and not the role and function of the novelist to interpret and communicate the real message and concerns of the novel to the reader. In Udaas Naslain the author seems to loosen his grip over the plot as it progresses towards the end. Abstraction takes over facts and events. Naeem, Azra, Najmi, Anisur Rehman, Dr Ansari and various other characters dabble in expression of abstract thoughts. On the other hand, story is paramount in fiction, and parts of this novel towards the end discount story at the gross cost of smoothness in the text. The grand stature and scope of the novel demanded a stable proximity between characters and their interactions. By comparison, Aziz Ahmed’s novels Aisi Bulandi Aisi Pasti and Aag as well as his novelettes display a consistent pattern of story-telling cushioned by the unfolding drama of human desires and actions. However, his novel Gurez often carries large patches of abstract intellectual discourses in the cafés, bars and clubs of Paris in the background of the Spanish civil war in the 1940s and the troubled relations between the imperial and colonial peoples. Quratulain Haider’s Aag Ka Darya and other novels such as Akhir-e-Shab Ke Hamsafar similarly exhibit a tendency to devote a large part of the text to intellectual conversation among friends and colleagues about life and its meaning, about love and its various manifestations and about time past, present and future. Haider’s grand thematic span is contrasted with her weak employment of male and female characters, much as in Abdullah Hussein’s novel. One can speculate that typically if not in every case the larger the social, political or cultural context, the weaker is the profile of characters in a novel. In this context, Tolstoy’s War & Peace and Anna Karenina remain glorious exceptions. The novel Udaas Naslain is however, rich in its content relating to thickly pitched and imaginatively integrated description of the neatly cut slices of life in its episodic treatment of the subject. In this context, one needs to mention its reflective style whereby an omniscient story-teller continues to move from one event to another and from one character to another in order to bring out the effect of a supra-local massive current of life. As opposed to this, Manto’s Gopinath, Mozeel and Isher Singh, and Krishan Chandar’s Kachra Baba are meaningful characters in their own right notwithstanding the larger forces shaping them. These characters elicit understanding, empathy and a feeling of association from their readers. Hussain’s love for significant moments in the Indian independence movement characterised by mass protest and its brutal suppression by the colonial government is such that he often manipulates his protagonists to participate in them or observe them with the naked eye, sometimes out of context with the mainstream flow of events. Naeem’s visit to Peshawar, Ali’s visit to Lahore and Azra’s participation in the protest against the Simon Commission do not carry any explanatory potential either for the plot or for the characters themselves. One is tempted to say that action supersedes actor in this novel. At the other end, it is hard to deny the superb craftsmanship of the novelist with which he paints a living and thriving picture of a community such as industrial labour or a locality such as a village with all the rusticity as well as crudity and coarseness of the idiom. His capacity to lay out the village scene is truly marvellous. Fifty years after its publication, the novel Udaas Naslain remains a living monument to the author’s ingenuity of style and richness of imagination. While it was written at a time when partition was at the centre of all fiction, still it is not exactly about partition except in the last chapter that related to migration and resettlement. One does not find Intezar Husain’s nostalgia or Shahid Dehlavi’s elegy for Muslims of Delhi in a moment of fleeing the murderous riots. However, the lasting effect of reading Abdullah Hussein’s novel is a feeling of sadness about the passing of a world that was brewing up multiple tensions in British India and the emergence of a pattern of life beset with the teething problems of a new nation. Urdu novelists have gradually moved away from partition as a theme and shied away from writing about larger entities and identities of cultural and social movements. Instead, they have generally focused on individual characters. That points to change of times in and around Pakistan where the historical and structural context of the Indian subcontinent has receded from memory, along with the process of looking inwards amid fears of existential insecurity. Udaas Naslain (Weary Generations) is an Urdu novel by Pakistani writer Abdullah. It won the Adamjee Award in 1963, the year of its publication. It is considered as a masterpiece and one of the greatest novels in Urdu literature. It was translated in English and published in London in 1999.